Datalab Agro Ukraine team attended National Internet of Things Conference in Kyiv. 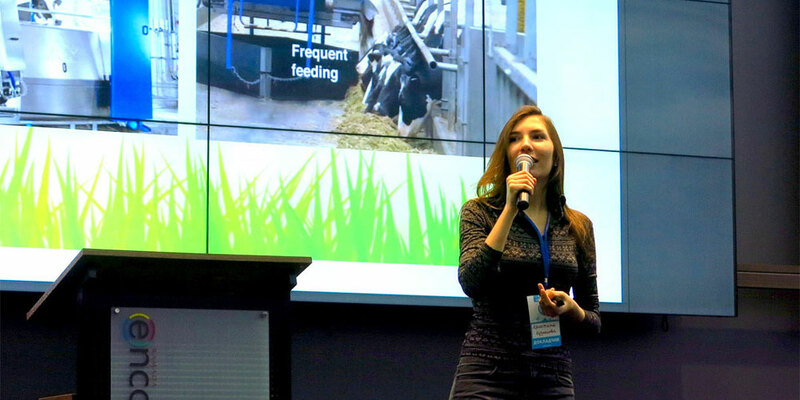 How Internet of Things makes agriculture smarter was discussed in Kyiv on February 27th. In the coming future all key agricultural decisions will be made with just a few clicks on a tablet or mobile phone. Farmers would still come to their field but mostly out of habit rather than necessity. Every morning farmers would receive complete farm overview charts to their e-mail, containing recommendations for the day. A bridge between agriculture and IT in the shape of universal IoT products is therefore the next necessary step on the way to a modern and innovative agricultural sector in Ukraine. IoT allows access and control of physical objects, including fields, animals, machinery via the Internet. IoT is not just a technical innovation; it is a necessary innovation, which – if correctly implemented – could help feed a hungry world and use natural resources in a wise way. Moreover, the technological innovations of IoT assist farmers to be more precise in their use of fertilizers and pesticides, thereby mitigating their environmental impact. To make sense of all the data that would be captured, we need sophisticated big data, analytics and cognitive computing systems that turn all that data into intelligence. These issues and more were discussed by Kristina Kuznetsova, Manager of Datalab Agro Ukraine. Ms. Kuznetsova presented key IoT solutions developed by Datalab in the areas of Crop Farming and Livestock Management, focused on Crop Optimizer and soil, water and leaf sensors, electronic pest traps, automated weather forecast, M2M communication. In the livestock sector we shared practical application of NFC tags and electronic herd management, milking and feeding robots, as well as drones to secure animal pastures. In March 2016, Datalab Agro UA participates at the panel discussion of GIS Forum Ukraine to share with other panelists, the general public, scientists and businesses the features of our GIS viewer and its applications to improve decision making on farms.